If you’re looking for the best dog nail clippers you’ve come to the right place. 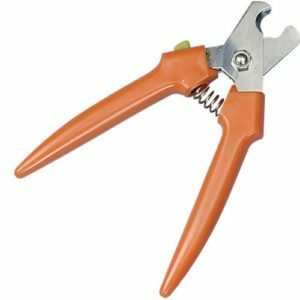 However not all dog nail clippers are equal and furthermore different types are better for different sized dogs. The good thing is that the difference in price between a professional set and a cheap and nasty set that could potentially hurt your dog is very little. So don’t go buying a cheap set and risk leaving your dog with jagged nails or worse still where poor quality blades result in an injury. That will be the last time your pooch lets you near him with clippers. Professor Paws aka ‘Fudge’ seen in the main image above has his nails trimmed with a large pair of Millers Forge clippers. He’s a large Labrador and these clippers cut his nails safely and quickly. Back in the day dogs like Fudge would have naturally ground down their claws but that’s not the case for the majority of dogs these days. Typically they spend less time off the leash and many don’t come into contact with hard ground like the concrete and asphalt required to wear down their claws. Furthermore senior or arthritic dogs that do less exercise may require their nails clipping more regularly. As a rule of thumb a dogs nails are ready for a trim when their claws touch the floor while walking, you may hear clicking or the nails may snag on the floor. Make a good buying decision and for less than $20 you’ll have a tool for your dog for life. Get it wrong and you’ll be forever paying your vet for what is a relatively simple 5 minute task. 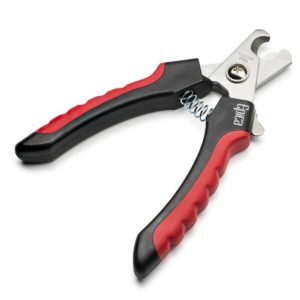 Before we look at the different types of nail clippers let’s consider why regular trimming is important. It’s a no brainer, you need to cut your dog’s nails regularly. So what types of dog nail clippers are there on the market? This is a tried and tested design and is perfect for trimming the nails of small to medium size dogs. They’re also relatively safe for beginners to use. You simply place the dog’s claw into the small hole within the tip of the tool. On squeezing the handle the blade slides across the front of the nail, trimming the excess. The only drawback with this design is the fact that the blade may need replacing at some point. This will be more of an issue for professional groomers than for pet owners. Brands like Resco do offer replacement blades to go with their products. This style of dog nail trimmer is the nearest thing to using everyday scissors for cutting. The nose of the clippers have a semi-circle indentation where you place the dogs nail. The stainless steel blades are strong and will cut cleanly through the nails of most dogs. Brands like Millers Forge offer models that are great for all sizes of dog, small, medium and large. For trimmers specifically for larger dogs, like Fudge, we would recommend a variation on the Millers Forge design. Models specifically for large breeds simply incorporate thicker blades as well as an improved mechanism to make cutting through thicker nails easier. 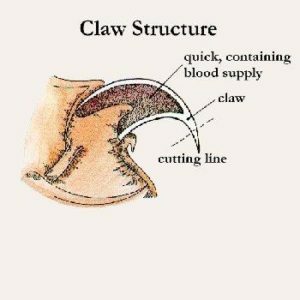 This type would be a little heavy handed for smaller dogs and may lead to more accidental cutting of the blood vessel and thus bleeding. For an alternative to a mechanical method of trimming dog nails why not consider a rotary powered solution? 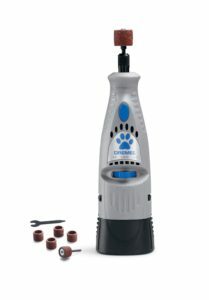 The likes of Dremel offer rotary tools for everyday household tasks but with a dedicated sanding head they can also be used for filing your dog’s claws. Don’t confuse these with cheap sets that will vibrate and cause discomfort this is a professional tool used by many dog groomers. Unlike human nails dogs have blood vessels that run down the center of their claws. Despite your best efforts at some point you may accidentally trim claws too short and cut into the dogs ‘Quick’ and cause bleeding. 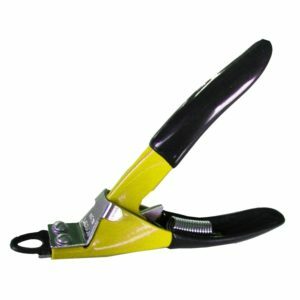 If you plan on purchasing a pair of dog nail clippers we recommend you do so in conjunction with a small pack of Styptic Powder from Cardinal Laboratories. This is a white powder that will quickly stop bleeding and aid the recovery of the quick. There is no antiseptic or anesthetic in this product the ingredients simply clot the blood and slow bleeding until it stops. In an ideal scenario you will never have to use styptic powder but just in case you can keep a pack on standby, the effectiveness of the powder never deteriorates. So you’ve decided to buy the best dog nail clippers you can afford. Well before you unleash them on your dog learn how to use them confidently and safely by watching the video below. The vet in this video also explains what to do if you accidentally cause bleeding. Incidentally she uses Millers Forge, plier style clippers for the German Shepherd. Your dog may be anxious or scared of having its nails cut. This might be due to a previous bad experience or not having it done often enough whilst at the puppy stage. You need to break the cycle and associate having nails trimmed with good things such as food and treats. Simply placing the trimmers close to your dogs food bowl will gradually get them to associate them with good something good. Dr Sophia Yin from Pet Health Network explains in more detail.